Bat is called "fu" in chinese which carries the meaning good luck and good fortune. The symbol of bat with two coins clinging on its wings imply "fortune just in front of your eyes" (fuk choi ngan cheen) and resembles long life, happiness and good luck. The bat enhances wealth, prosperity and happy energy. It will help smoothen ones endeavour. Giving a such an amulet to your loved ones will harness good fortune to the recipient. Also great for birthdays and seasonal celebrations. One can display this powerful symbol of fortune in their personal sheng chi direction or wealth corner to harness money luck. Newly redesigned into a futuristic trend, this fabulous mystic knot is carved within the perimeter of a "mei hua". They are no longer tied with strings like the previous design, but pre-assembled with more durable material for better lasting. The mystic knot carved out of jade is the most influential symbol in Period 8. Those wearing or displaying this powerful mystic knot symbol will have the influence of the number 8 multiplied, thus enjoy extra good fortune. Mystic knot is also equivalent to the infinity sign done endless times. The jade is also a strong representation of earth energy, which synchronizes with the base element of Period 8, thereby making it most potent. This product can be hung on handbags, in cars, offices, living rooms and bedrooms to multiply your health luck, wealth luck, relationship luck and extremely good fortune in all areas of your life in the Period 8. The presence of the double happiness symbol is an auspicious enhancer for those who are seriously looking for marriage luck and proposals from the one you love. The amulet is made from genuine natural jade and pre-assembled with beautiful accessories. The double happiness symbol is a very powerful symbol of conjugal bliss and happiness in marriage and family life. It promises sustainable happiness in a relationship. Feng shui enthusiasts had also claimed that the double happiness symbol reduces anger and quarrelling wherever it is present. The item is also a perfect wedding gift for your close friends. 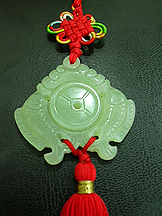 This is the symbol of large double carps amulet with mystic knots and tassel. Double carps resemble joyous unions, marriage luck, abundant good fortune, prosperity, successful examination and literary luck. Both the carps are energetic and determined to resist any big currents in the yellow river. Both the carps are determined to leap to attain higher achievement to catch a big chinese prosperity coin. They are tastefully crafted by hand and made in bright red colors. 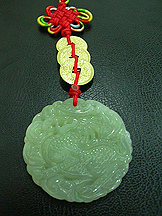 This truly extravagant dragon amulet is carved from natural jade stone. It is further strung with three gold emperor coins of Kang Hsi, Yong Cheng and Chien Lung for amplified good luck. The beautiful design would make this amulet a handsome gift for your loved ones. Dragons are filled with energy and usually marks the start of successful events. It is especially auspicious for those who are embarking on a new endeavour or career. Keeping this amulet would ease their efforts to have full grip and control on their fortune and luck. The Dragon has a healthy body and the gesture depicts its potency to stay in the forefront of success.This is highly recommended for ambitious people, business people, politicians, managers and executives looking for success. This is a fabulous pair of phoenix clinging on a coin. The phoenix is the goddess of all the winged creatures. This heavenly bird will harvest opportunity luck, magnifies chances of success in all endeavours and prosperity.The Phoenix surprises people by turning bad luck into good luck. It would mysteriously carve out path of opportunities to your business, work, career or all other pursuits of your life. Since it is associated to the south corner, its presence brings you fame and popularity. It would bring out the excellent side of the female. It can even remove quarrelsome energy of a kindling relationship with the fiery energy of the Phoenix. The perfect item as well for the single female looking to find true love. It also enhances the matriarch luck and power of female leaders. The usage of AA grade white jade disc is a secret our own Feng Shui Master would like to pass on to feng shui practitioners worldwide. The usage of white jade in generating metal element is more potent and surpassing the effectiveness of chinese coins made from bronze. It is never used because the cost is very expensive! White jade being a natural gemstone stores potent earth energy that is metal magnifying. Crafted in the shape of disc where both the perimeter and the hole is in circular shape, it correctly represents the solid male-line in 3-dimension of a trigram. These white jade discs can actually create and build an energy aura with a radius of about 2 meters. Therefore it is best to shield one from afflicted energy when displayed in afflicted zones. This amulet tied in 6 pieces with elegant gold string and the expensive satin tassels has the same meaning with amulets that are tied with 6 Emperor Coins to complete the CHIEN HEXAGRAM (BIG METAL). One should display this amulet at doors that are in the location or facing the direction south where 5 Yellow is.